6:00 p.m. We’re here — let’s get started. Oh wait, Berkeley time. 6:10 p.m. Berkeley time … meeting still not started. 6:15 p.m. Meeting called to order (it’s about time). Roll CALLLL. 6:16 p.m. Oh god, they’re talking about the Bill of Rights. Also, “and whereas” has been used at least four times already. Excessive? We think so. 6:21 p.m. Time for public comments — 30 seconds apiece. 6:22 p.m. First up, President of the Berkeley College Republicans (BCR) Shawn Lewis stumbles through 30 seconds of defending the bake sale. 6:24 p.m. Derek Zhou (Internal Vice President, BCR) encourages everyone to “do the right thing, to look past race” and to “eliminate all restrictions on race … ” BRRRRING. Out of time. 6:25 p.m. Speakers’ time amended to 45 seconds apiece … Woohoo, freedom! 6:25 p.m. Francisco Loayza (Treasurer, BCR): “I don’t wanna be judged by my skin color … Look beyond the prices; look at what we’re trying to do and don’t limit our free speech!” Thid dude deserves a prize — he finishes his spiel with five whole seconds to spare! 6:26 p.m. Salih Muhammad (chair of the campus Black Student Union) starts speaking. Snaps abound. “Although this was not intended to be offensive, the fact that it was offensive” is the problem. 6:29 p.m. Ben Goldblatt (former secretary, BCR): “I implore you not to seek out and persue a witch hunt against the BCR.” Concludes by quoting JFK. Classic. 6:32 p.m. No more public comments. 6:35 p.m. Voting on the “Bill in Support of Respectful ASUC Student Group Conduct” as it stands: Aye, aye, aye, aye, aye, aye, aye, aye, aye, aye, aye, aye, aye, aye, aye, aye, aye, aye, aye. That’s 19 ayes, in case you didn’t want to count ‘em all out. 6:36 p.m. Things are getting a bit self-congratulatory. One senator even goes so far as to thank the ASUC for how they’ve dealt with the matter. 6:37 p.m. SQUELCH! Senator Noah Ickowitz thanks everyone for coming. Also makes a point of saying that “we would never want to silence any political voice.” Well that’s a relief. 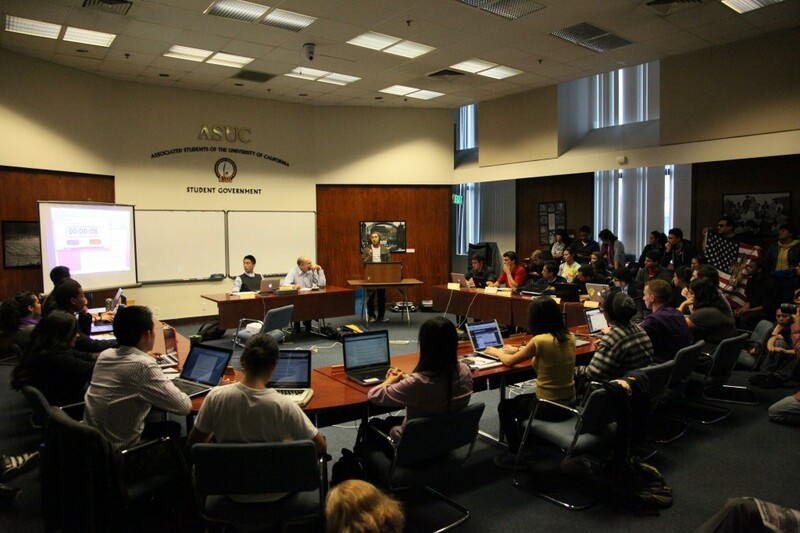 6:39 p.m. Now they’re talking about the ASUC’s weekly ad that runs in the Daily Cal. Boooring. 6:40 p.m. Pretty much all the peeps who came for the bake sale conversation are leaving, Alabastro looks confused. 6:41 p.m. Motion to adjourn. Meeting adjourned. Clog OUT!